Who knew it? Looks like our old family homestead, now sold and in a declining neighborhood, was probably a Sears Modern Home. 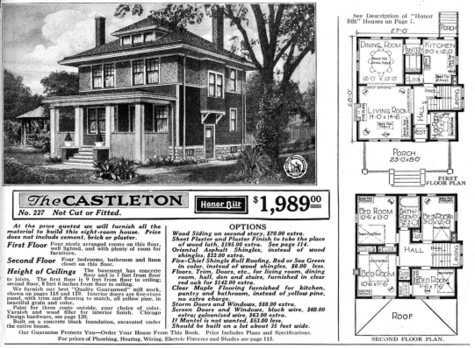 The Sears plan below sure looks a lot like our place at 914, scene of all holiday gatherings from the old days in Terre Haute. Grandma Mabel lived there all her adult life; dad grew up there and so did his dad. We all attended Warren Elementary right down the street. Family lore has it that a relative built this place, but needed $$ to pay off gambling debts. My great grandfather arranged a swap that netted his family this big, spiffy four-bedroom home sometime after the turn of the century (well, the next-to-last turn of the century). Just a few items differ from the plan below including elimination of the fireplace and slightly different stairway treatment. Click image below to enlarge it.